I took the opportunity to visit McConnells Mill State Park in early October 2013, and though I was a bit early for the best of the colors, I was nonetheless treated with some spectacular scenery. Knowing that morning light could often lend to more interesting and attractive photos, I went out early and caught some great reflection images in the water near the fall at the Mill. Some of the shots that I most enjoyed were those that showed interesting reflections of the foliage surrounding creek. This first shot was rendered by my iPhone 4S and is one of my favorites, especially seeing how the reflections bent and twisted as they were displayed just above the falls. I took some similar shots with my Nikon D40X. Another of my favorites was a shot that I took that included the reflection only, which appears to be an altered photo, but in reality it is a simple zoomed-in view of the reflection. If you examine these photos and the larger selection displayed in the "Fall" tab on the Web site, you will see that the sun had almost extended to the base of the hill on the opposite side of the creek. If I had arrived too late, the sun would have already started to display in the water and the reflected foliage would not be as clear. The first day that I went I was far too early, arriving just an hour after sun rise. As it turns out, in early October, the best time to take photos like this is between about 9:15 am and 10:00 am. On the two days that I took the shots, 10 am was the time when the colors and reflection was at the peak, just after 10 am the sun started to shine in the water and the reflection was washed out. Off course if you arrive too early, the sun is not displaying adequately on the foliage and you will not see any reflection. Depending on the exact day that you go, the best time to capture a reflection photo will vary. My photos were taken October 6th and 7th. Looking at sunrise and sunset times for October here, in nearby Pittsburgh, you can adjust your times accordingly. With the sun angle changing throughout the year, I am sure that you will need to experiment a bit if you are looking to shoot similar photos. The chart shows that from October 1st to October 31st there is a 32 minute difference in sunrise times. I also just got myself a polarizing filter which might have helped remove some of the glare in the photos. I am learning something new every day. Enjoy your trip to McConnells Mill State Park! McConnells Mills State Park - Look up! On a recent June 5, 2013 walk through McConnells Mill State Park with my son I took a minute to lie down and rest on a soft ground covered with pine needles and fern.When I looked up I was treated with a view that reminded me of the simple beauty of nature and why I keep returning to the McConnells Mill State Park and the trails that cut through it. The first photo was taken with my iPhone 4s and the second two photos were taken with a Nikon D40X using a NIKKOR 18-200mm lens. The iPhone 4s photo is remarkably good considering. I have found iPhone to take decent photos when light is good. If you have not been to McConnell's Mill State Park after the leaves have fallen and before snow or ice begins dominating the scenery, you are missing somenting. On a recent November 2012 visit to the park I was treated with some beautiful scenery. The day was clear and cool and in the upper 40s, a perfect day for a nice walk. Evidence of some sub-freezing temperatures was noted after seeing a few small ice cycles clinging to a few cliffs, but winter is scenery is still a month or two away. While walking part of the Slippery Rock Gorge Trail I also noticed how it was easier go off the trail without realizing it. In the summer there is enough vegetation surrounding the trail to help keep you on the path. With almost no vegetation and a bed of leaves covering everything, I had to stop a few times and look for trail markings on the trees or stop and think about where the trail actually was. The visit was another reminder of how lucky I was to have grown up just a few miles from the park. In the coming January or February I am looking forward to a winter visit to capture more images from the park. through a limestone cave. When the roof collapsed the channel was exposed. Photo taken with an iPhone 4s. Flumes make for some interesting photographs. Photo taken with an iPhone 4s. The Mill at McConnells Mill State Park. Photo taken with an iPhone 4s. There are a lot of things that I love in this wonderful life. I love God and I love my family. Though this world can be trying at times, I love life, and try to make the best of every day. I also love staying active and healthy and I absolutely LOVE the outdoors. My perfect vacation is with friends and family situated not to far from a national or state park or a not too crowded beach. I was born and raised in a little neighborhood that we called Castlewood and that others might call Energy, situated between New Castle and Elwood City. I grew up in what most would call the country, where a big back yard was one that you could play softball in without having to search for too many balls that end up in the weeds. Before Moraine State park was created we would go swimming in Slippery Rock creek at the Armstrong Bridge. I can still feel the sharp rocks under my feet as we walked from the shore of the creek to the water. A very short distance from my home is the fantastic state park called McConnells Mill State Park. When I was young we had family reunions at the park, up the hill from the covered bridge and old mill, near the entrance off Route 422 via McConnells Mill Road. We also frequented Hell's Hollow (about two miles from my home), part of McConnells Mill State Park, and a 7.2mi hike to the old mill and covered bridge. The 7.2mi hike starts at the Hell's Hollow parking lot and follows the Slippery Rock Gorge trail to Eckert Bridge, then on to the Kildoo Trail to the old mill. 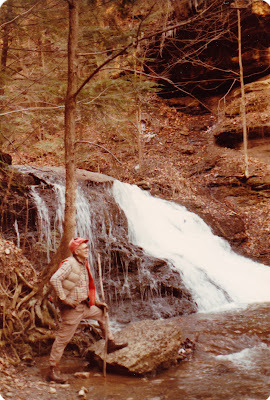 Very soon after leaving the Hell's Hollow parking lot you have the option of going left on to the Slippery Rock Gorge trail or right for a short walk to a very nice waterfall. So, why this Website? I wanted to create a tribute to a place that I love so very much. Though I was born and raised very near McConnells Mill State Park I now live in Houston Texas. Much of my family still lives near the park and I make it up there about three times a year. One of the first things (and the middle and last thing) I do when I get home is hike in the park. On a recent visit in June 2012 I did two four mile and two eight mile hikes/jogs. The jogging part is a little crazy but I enjoy it, until I stumble over a root and end up doing an unplanned push-up (why I wear gloves when jogging, protects my hands when I stumble). I also caught some beautiful colors there last fall and plan on hitting fall and winter this year.